Since the financial crisis, traditional banks have remained locked to all but the very best credit borrowers. Even as the stock market surged, it’s been harder and harder for regular people to get a loan. With banks unwilling to fulfill their responsibility as lenders, a new kind of lender has come forward to fill the gap. That’s meant the rise of peer to peer lending and p2p personal loans. These new types of lenders and loans are opening up the banking system to different borrowers, even those with bad credit. Taking advantage of the new trend in peer to peer personal loans means understanding how they’re different from traditional loans as well as the pros and cons. While peer to peer lending seems like a new trend, the idea is nothing new and banks have actually been doing this for hundreds of years. Banks are in the business of making loans, not holding them and collecting payments. It might surprise a lot of people but banks actually sell your loan to investor groups, pension funds and insurance companies almost immediately after you sign. Peer to peer lending takes the bank out of the picture. A borrower fills out an application on the website and investors pick in which loans they want to invest. The website helps by doing all the credit checks and collecting payments from borrowers each month to pass the money through to investors. Peer to peer loans are personal loans which are unsecured installment loans, meaning you don’t put your home or car down as collateral. That means less risk for borrowers since you don’t have to worry about losing your home, it means higher interest rates. The upside to a peer to peer personal loan is that you can use the money for anything. I’ve used p2p loans for debt consolidation, home improvement and for a vacation. What Credit Score Do You Need for a Peer to Peer Loan? The credit score you need for a peer to peer personal loan is probably the first question I get from new readers. Many of them have been turned down by a traditional bank or even some of the other peer to peer loan sites. The short answer is you can usually get a p2p loan with a credit score of at least 520 FICO. Where you apply though will have a lot to do with the interest rate you pay and whether your application is approved at all. There are a few bad credit peer loan sites that specialize in helping people with lower credit scores. These include PersonalLoans.com and BadCreditLoans, which I’ve used twice before. You should be able to get a loan with a score in the 500s but will still need a job and at least $2,000 a month income. If you have a little higher credit score, you’ll be able to get lower interest rates on some of the more restrictive sites like SoFi and Upstart. These websites often require a FICO score of at least 680 but I’ve heard of people getting approved with a lower score. Regardless of your credit score, there are a few things you can do to make sure you get approved and at the lowest rate possible. Apply for only as much as you need. Lower loan amounts mean lower monthly payments and lower rates. Apply for shorter-terms of three years or less. One- or two-year loans will come with lower rates and are more likely to be approved. Try paying down your credit cards first to lower your credit utilization ratio, an important measure of credit worthiness. What Can You Do with a Peer to Peer Loan? The best part about peer to peer personal loans is there are no restrictions on how you use the money. Your loan is deposited into your bank account and you can use it any way you wish. My first personal loan was in 2009 after destroying my credit score in the housing bubble. I needed a loan to pay off credit card debts and get my head above water. My credit score of 560 FICO meant I couldn’t even get in the door with the loan officer at the bank. Fortunately I was able to find a peer to peer personal loan site. Since then, I’ve used p2p loans for home improvement and a vacation. While you can use a p2p personal loan for anything, there are a few ways most common among readers. Debt Consolidation – Nearly eight-in-ten personal loans are used to pay off credit cards and other debts. P2P rates are usually lower than credit cards and other types of loans so it’s the perfect opportunity to lower your monthly payment and save on interest. Medical Loans – I’ve seen a huge trend in doctors providing financing through their office but what most people don’t understand is that these loans are usually at rates of 36% or higher. People don’t even think to check because they trust the doctor. A better option is using a cheaper peer to peer personal loan for surgeries not covered by insurance. Wedding Loans – Let me be clear, I don’t recommend going into tens of thousands in debt to pay for one day of your life. I don’t see a problem with someone borrowing a few grand for a nice wedding but there’s a fine line here between enjoying the day and going overboard. Car Loans – A lot of readers have told me how they used a peer to peer loan to pay off the car they bought at one of those buy-here, pay-here lots. Rates can be as high as 24% on those lots so anytime you can refinance at a lower rate, it’s a good deal. Which is the Best Peer to Peer Lending Website for a Loan? I’ve used and reviewed dozens of p2p personal loan sites. Finding the best site is more a matter of finding the best one for your needs than it is finding one website that’s best for everyone. For example, some p2p sites specialize in a certain type of loan. Payoff specializes in personal loans for paying off credit cards and asks borrowers to only borrow for that purpose. The specialization and lower defaults means the site can offer lower rates for people that apply. Other sites that specialize in types of loans include SoFi which started as a student loan refinancing lender but has since expanded into personal loans, mortgages and medical loans. Other peer to peer loan websites specialize in different levels of credit scores like PersonalLoans and BadCreditLoans. These sites are set up to lend to borrowers with bad credit. 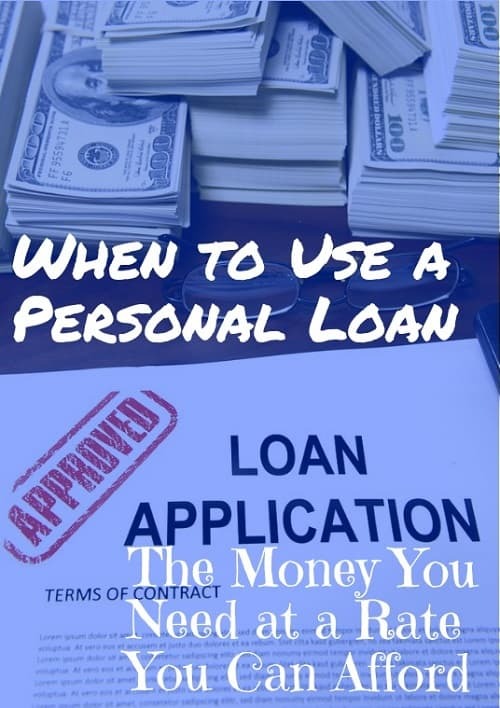 Personal Loans runs on a special model that shops your loan around to personal loans, p2p and even traditional bank loans depending on how you qualify. Still other sites specialize in types of borrowers. For example, Upstart runs on a unique lending model that factors in your education and degree to approve borrowers recently graduated. Getting a loan with bad credit can be tough. You need money to stop getting in debt but you can’t get a loan because of all that debt and bad credit. That’s why debt consolidation was my first stop in 2009. By pledging to pay off existing debt with your personal loan, you’re telling the p2p lender that you’re trying to improve your finances. You’re not asking to get further in debt, you’re trying to get out ahead. Debt consolidation loans tend to be approved more frequently and at lower rates. Combine that with borrowing a smaller amount and on shorter-terms, can usually get most people approved. Another trick I’ve seen work to get approved is the stair-case loan. Borrow a very small loan, no more than a few thousand, that you can pay off in less than a year. Most people should have no problem getting this kind of a loan. Make regular payments and pay the loan off within the year. The payments will help build a good credit history and boost your credit score. Peer to peer lenders are more likely to approve a loan to someone that has already paid off a prior loan. That’s going to make it easier to get a second loan even if you still have bad credit, and you can borrow a higher amount this time. There are some risks to peer to peer personal loans that you need to understand and avoid. The pros outweigh the cons on p2p loans but there are some traps to watch. Apply on several websites to make sure you get the best rate available. Applying for a p2p loan doesn’t affect your credit score. P2P sites are required to show you the rate on your loan before you accept. Make sure you understand the rate and monthly payment before you accept the money. Peer to peer loans can come with high rates for bad credit borrowers so you need to ask yourself if the money is really worth it. Missing payments on a personal loan will go on your credit report and hurt your score just like any loan. Understanding the risks and benefits to a peer to peer personal loan will help you get the money you need at a rate you can afford. You can use a p2p loan for any purpose but there are a few that are most common and will help you get out ahead of your bills.